The best Sunday alarm clock is sunshine on chrome. That's what the motorcycle is, a system of concepts worked out in steel. 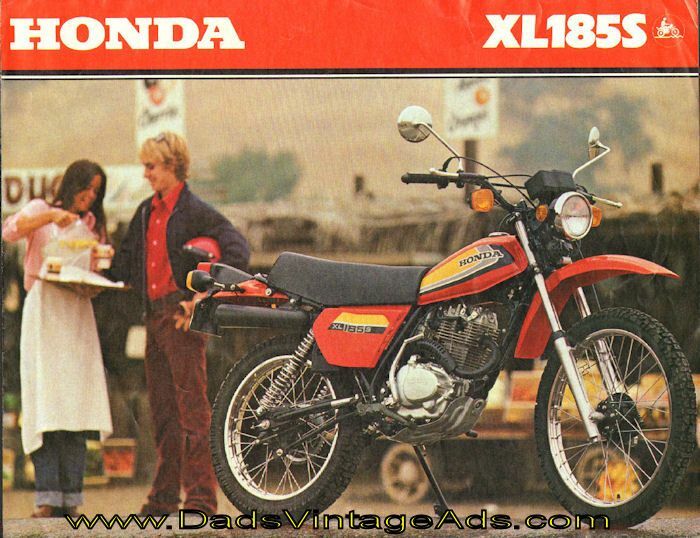 My 1979 Honda Enduro XL 185 is cherry red with 9,000 original miles. It was produced for the highway and off-road as a specialist dual sport from 1979-83. It's a single cylinder, 180cc, four-stroke, five-speed, chain driven, air cooled, and with a top speed of 60 mph that I mean to reach before noon on a smooth stretch of desert pavement. I began, paused in the black saddle, looking over the handlebars at the expanse of desert east of Slab City. Six distinct terrains appeared before me: dirt tracks, rutted tracks, washes, black pavement, overland, and sand. I would develop the best riding style for each by testing the two forces the desert would decree on the bike: center of gravity and angular momentum. This was a tall order, because the last time I rode was a decade ago. My neighbor had rescued it from the mitts of Slab City thieves who had loaded it onto a trailer and were about to pull away. The neighbor had kept the bike in storage at his camp until I was ready to tackle it. I had obtained a DMV one-day 'Permit to Move' that was good for the Sunday ride. I began like a baby, hardly able to crawl. Rather than try to be a natural on it, I took it in steps, gradually advancing toward the more difficult and speedier. • Dirt track – Undulating with some sand, but free of ruts and stones. • Rutted dirt tracks – Trickier with old tire or water cuts. • Washes – Dry streambeds, except during flashflood. • Desert pavement – Smooth worn surfaces of interlocking rocks that has a glassy appearance. • Overland – Open desert. • Sand – Includes sandy spots, and deep sand like dunes. Most people just get on and ride, but I prefer a scientific approach of identifying variables, quickly testing each, saving the best, and then ride relaxed for the rest of my longer life. The two primary factors in dirt bike riding are center of gravity and angular momentum. These in combination keep the bike upright over rough land. Center of gravity is self-explanatory, but angular momentum is not. Each wheel acts as a gyroscope to hold the bike in the same plane that it is spinning. The faster the wheels turn, the stronger the effect; if you go fast enough, theoretically, your wheels need not touch the ground to stay upright. • Dirt tracks - The bike may be brought up to its near maximum of 60 mph. The science that keeps it upright on 21" front knobby and 18" rear tires is astonishing. It 'drifts' above the ground surface touching it as little as possible and using solely the angular momentum of the wheels for balance. The bike cannot tip over since it is essentially floating through space on two vertical gyroscopes. I put a mental governor at 50 mph to honor my common sense of the voices of thousands of ghosts of survival. • Rutted dirt tracks – The technique uses the ground surface for traction in an odd way. The tires are 'shrunk' like a sports ball for greater density by the bounces to provide greater angular momentum. It is palpable. I could do 40 mph on these roads, slowing for ruts not by breaking but by downshifting. • Washes - These are an all-out blast using ground traction with twists and sudden waffle iron cracking from drying past sweeping Palo Verde branches. The wash races uphill in a wind for miles at 25 mph, until it narrows to a stenosis. It's like riding a pinball in a busy machine with many natural 'bumpers', and the usual speed is an interrupted 25 mph. • Desert Pavement - The runway of black pavement of volcanic rock may stretch for a quarter-mile into the foothills. I took off like the road runner cartoon. The technique is to float along with little traction, relying on angular velocity to keep the bike stable. If you start to skid, give it a little gas, as angular acceleration increases the stability by the square of the increase of mph. I kept the sprints to 30 mph to not kick up rocks to preserve the beautiful smooth canvas. • Overland – The stage is a march of changing terrain at the front tire. The recurrent surprises are bushes, rocks, trees, Ironwood stumps, sand traps, dips and rises, dust devils, cacti, and rattlesnakes. The faster you go, the more you have to be on your toes. I felt like a midget operating a sledgehammer, constantly being bullied around over rough ground, and tossed out of the seat like a raggedy Andy. • Sand - I mastered last sand. The normal technique is to deflate the tires from 25 psi to about 10 psi to spread the surface area of the tire, until the tire is so flattened it is able to ride on the sand itself. However, deflating was not practical on alternating sand and hard patches, so in 10" or deeper sand on stretches of a quarter-mile or longer, I used a Frankenstein technique where I sat in the saddle at 5mph, and took looping 10' steps with either foot on the cycle sides. I hadn't ridden in ten years, and there was only one spill per annum – always at slow speed in surprise sand traps, and the bike came tumbling after. A computer generated model of the bike and its rider on an uncontrolled turn shows only his helmet, and his conscious taking the shape inside the frame, hoping beyond hope. It got to be like leaving an animal scent: the bike left a little oil, and I a little blood. I just pulled out the toilet paper and duct tape to make compression bandages to stop the bleeding. Once I tumbled into a red ant hill, and got stung about twenty times, which was more memorable than any of the falls. The fascinating sequence of pain is twenty minutes each of sting, as the venom streaks up the lymphatics, followed by ache, as it enters the muscles, concluding with a burning of the skin, and final relief. Each time the 260 lb. bike fell, it was a clean-and-jerk effort to upright it again, shaking the ants off before they clogged my air filter. Once I developed a satisfactory ride for all six terrains, I slowed, and cruised. The six now had to be blended into each other to meet head-on the quick changing pattern of the desert. It was like orchestrating a band to suit the audience. I mentally rehearsed as I cruised blending one into the next, with all combinations, and solved the Sunday ride mentally before applying it physically. Now in my mind, like the parts of the Honda, there was a working mobile synergy. With the short learning of two hours out of the way, now I could ride any surface and enjoy the sightseeing. Heading overland on the fringe of the Chocolate Mountain Gunnery Range, my eyes lifted to three helicopters approaching low from the south. I pulled instinctively before being spotted like a chased animal under an Ironwood. The fat copters looked like Mil-17's, pregnant with troops, as they swooped overhead so even the Ironwood branches rustled. They landed a scant half-mile away on a black pavement. The rascal in me took hold, and I shut the engine, and started walking up a draw to toward them. As I neared, the choppers rose lighter, it seemed, and took flight. When this happens, a dust cloud is thrown a quarter-mile out in all directions, and several stories into the sky. In that cover, I walked another few minutes, guessing they had deployed about sixty US Marines for desert training. I would be a good object for them, but knowing a little of their bureaucracy, thought that they might mistake me for an official observer in a camouflage tank top, sunglasses, and black boots. Abruptly, I rounded a bend and spotted fifty yards away the first group of ten Marines in field dress, scrambling to their feet with weapons at ready. I raised my sunglass, waved nonchalantly, and did an about face. They didn't follow, but wouldn't have mattered because it was unclear if I was on the unsigned range or not; the US military makes mistakes, and so do I.
I rode the Honda thirty minutes away, and stumbled on a 30-foot military dumpster with 8-foot sides and a ladder leading to the top. I climbed, and peeked over like Kilroy. The floor was littered with dozens of unopened MRE (Made Ready to Eat) rations. MRE's are self-contained complete meals packaged for the US Armed Forces. I knew each contains an entrée, side dish, crackers and spread, drink, and desert. Just looking at them made me hungry. They are coveted by Slabbers, and I could have opened an MRE stand, selling packets for $3 while they lasted. I greedily teetered, but noticed there was no inside ladder leading out. I could have survived for about a month down there, and would have expired before the packages, that have no expiration date. Instead, I used a length of rope to lasso one Beef Stew, which took a dozen throws for five minutes, and decided that one was enough. Besides, the sun was setting. It closes fast in the desert. My camp drew near on the Coachella Canal. I squinted, my face wrinkled up like a chipmunk under the baseball helmet. I arrived at sunset back at the Slab Camp, on a near empty two-gallon tank. At about 50 mpg, I had gone nearly 100 miles over rough terrain on this Sunday drive. Beef Stew is nearly as important as petro at the end of a Sunday ride. I felt exhilarated. I felt I had achieved a rare distinction. I had driven a vehicle in a way that would terrify a New York cab driver, and felt safe. The dirt bike is the most versatile machine out there, except for the life form. You look at where you're going and where you are and it never makes sense, but on looking back at where I had been a pattern seemed to emerge. Slowly, by nuts and bolts, I had built a mental manual for open desert riding and life. The lessons are: Never hesitate to ride past the last stop sign at the edge of town. Don't hesitate to practice on the roughest ground. Well-trained reflexes are better than luck. The more you look around, the more you see. You don't stop riding because you're getting old, but you get old when you stop riding.And, the real cycle you're working on is yourself. I filed everything away in the back of my mind, to use next week. Not everyone has a cherry red motorcycle, but everybody has different theaters of life. The goal is to develop the best character in each, and then to meld them into one whole self. In this way, one Sunday ride can last your whole life. I’ve been riding since I was 5 and racing since 11 years old. I have 45 years of experience. No, broke it down in 45 minutes. Fantastic. Lack.